Among the challenges that the Impressionists set for themselves was that of capturing the effect of snow and ice on the landscape. 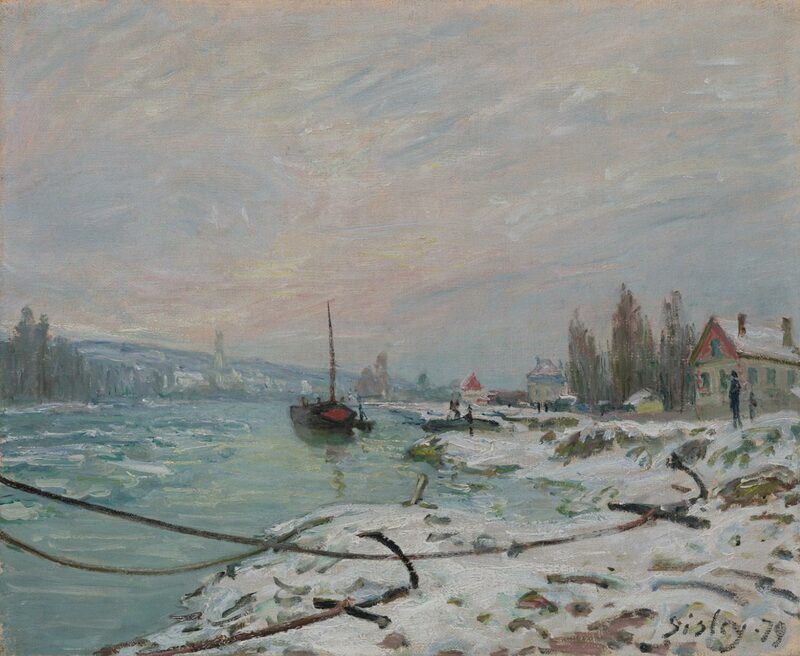 Sisley excelled in such monochromatic wintry views, as demonstrated in this sensitive rendering of the Seine at Saint-Cloud in which the snowy river bank is dramatically crossed by black lines of anchors. The artist’s interest in the sky and the fugitive effects of light and weather are depicted here in nuanced tones of white and blue. Dr. Brocq, Paris, by 1904 . [With Gérard Frères, Paris?] . With Paul Rosenberg & Co., Paris and New York . With Edouard Jonas, Paris, by 1934; sold to Otto Haas (1872-1960), Haverford, PA, November 13, 1934; by inheritance to his son John Charles Haas (1918-2011) and Chara Cooper Haas (1927-2012), Villanova, PA ; Chara Cooper Haas; gift to PMA, 2011. 1. Presumably Louis-Anne-Jean Brocq (1856-1928), a dermatologist and art collector. Lent by Brocq to the "Exposition d'une cinquantaine d'oeuvres de Sisley, faisant toutes partie de collections particulières," Galerie Rosenberg, Paris, November 7-24, 1904, no. 8. 2. See stamp of Gérard Frères, 2, rue la Boétie, Paris, on reverse of canvas. 3. Provenance per François Daulte, Alfred Sisley: catalogue raisonné de l'oeuvre peint, Lausanne, 1959, no. 346. 4. Copy of dated receipt from Jonas to Haas in curatorial file.